Many of my collectors comment about my paintings in very positive ways. It is such an honor to have others tell me how my artworks affect them. Marie D. perusing through the painting album. I am grateful for her support and kind words! “To take a tour through the Studio/Gallery of Alberta Artist Judy Leila Schafers is a privilege to me. 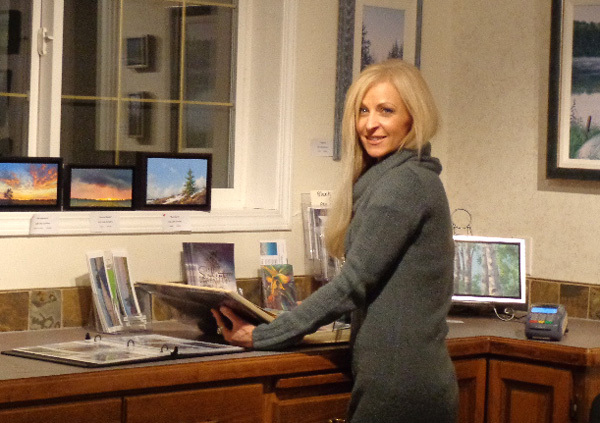 The amazing depictions in her fine art acrylic paintings truly express the soul of the land we live in. From breathtaking scenes of open prairie fields that honor the labor and passion of the local farmers life’s work, to the wondrous rocky mountains of Alberta. I can almost feel the sun on my face as I look ‘into’ her paintings of blue sky and golden fields of grain, or the cool humid air as I gaze at the mountain scenes. Each painting has a very real sense of ‘being there’. The rolling thunderous clouds of storms approaching, the rustling leaves on the birch trees, the misty hay fields of fall, to the crisp icy snow below my feet, Judy’s paintings capture the moment in time that make me stop and gaze at the beauty of nature with wonder and appreciation. 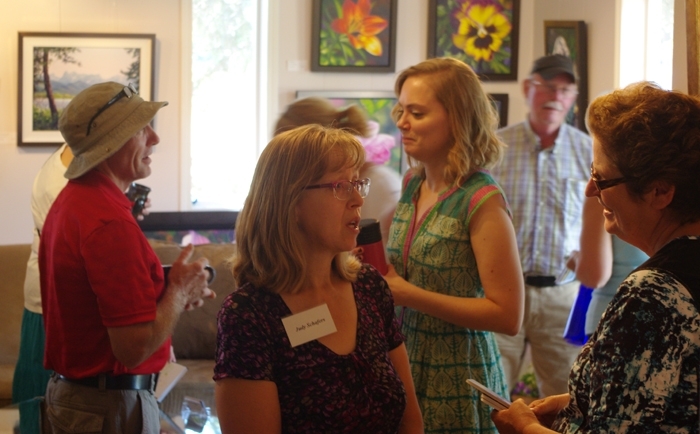 I recently attended Judy’s ‘Open Studio’ show and sale. Her more recent work had taken me on a ‘Down to Earth’ journey, Literally! As if from a worms-eye-view. It was like being on an amazing journey exploring the living organic world super close up! Sunlight shinning through a coleus leaf, the reflection of a dew drop cast onto a porous stone, or the foggy mist rising up from the warm earth. It took me back to a time as a child when my sister and I used to explore the forest and near by ponds on our family farm. Simply put, Magical. It’s always a pleasure to speak to those who come to visit! talent! I will continue to follow you through your newsletter and website. 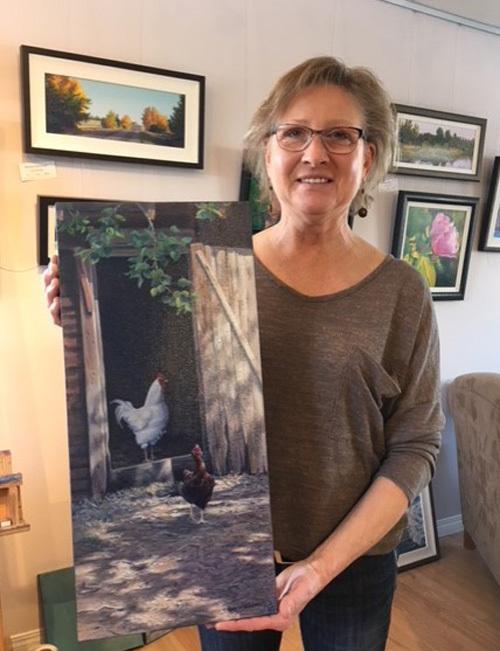 A Happy Collector with her new commissioned painting! “Judy, you are an absolute ‘magician’ when it comes to capturing light on canvas!